Prior to Roe v. Wade, hundreds of thousands of illegal abortions occurred in the United States every year. Rickie Solinger uses the story of Ruth Barnett, an abortionist in Portland, Oregon, between 1918 and 1968 to demonstrate that it was the law, not so-called back-alley practitioners, that most endangered women's lives in the years before abortion was legal. Women from all walks of life came to Ruth Barnett to seek abortions. For most of her career she worked in a proper suite of offices, undisturbed by legal authorities. 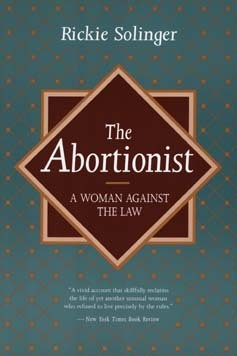 In her years of practice she performed forty thousand abortions and never lost a patient. But in the anti-abortion fervor of the post-World War II era, conditions in Portland and elsewhere began to change. Barnett and other practitioners were hounded by the police and became convenient targets for politicians and sensation-hungry journalists. Desperate women continued to seek abortions but were forced to turn to profiteering abortion syndicates run by racketeers or to use self-induced methods that often ended in serious injury or death. Solinger makes vivid use of newspaper accounts and extant legal transcripts to document how throughout the country laws were used to persecute competent abortion practitioners. While Roe v. Wade has alleviated some of the danger that shaped women's lives before 1973, Solinger points out that the abortion practitioner is again threatened in the United States, this time by the violence of anti-choice fanatics. Her book is an instructive reminder of the vigilance necessary to protect both women and those who would provide them with freedom of choice. Rickie Solinger is the author of Wake Up Little Susie: Single Pregnancy and Race Before Roe v. Wade. She lives in Boulder, Colorado.